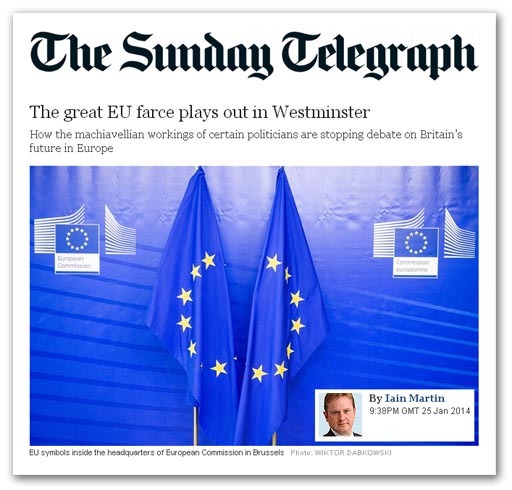 With the arrogance typical of his breed, Iain Martin, under the title, "The great EU farce plays out in Westminster", is telling us that the "machiavellian workings of certain politicians are stopping debate on Britain’s future in Europe". Actually, the debate goes on, and has been going on, without the help (or hindrance) of "certain politicians" and certainly without the hindrance of the legacy media. What Martin is reporting on, of course, is Friday's debate, where their lordships effectively dispensed with the ongoing charade of the EU Referendum Bill, making evident the simple fact that this was a referendum that was never going to happen, simply because it cannot. Martin thinks the debate in the Lords was the "farce", but I would venture that such an assessment is a misrepresentation. As before, in the previous debate, there were cogent reasons given as to why the 2017 referendum date could not stand, thus making a nonsense of the Bill. Not least was another intervention by Lord Kerr, and once again his arguments are ignored by the likes of Iain Martin, who evidently must find it uncomfortable to be confronted with a clarity of logic that points up the irrelevance of the Bill and the intense activity surrounding it. Given the prominence and the length of the Kerr intervention, and the fact that his views are mirrored elsewhere in the debate – and have been repeated throughout the series of the debates, one can only assume that the absence of any mention in the media is an act of active self-censorship on the part of the legacy media. Thus, if anyone is stopping the debate, it is the likes of Iain Martin, who has gone along with the charade that the Bill is of merit, and worth something more than our scorn, as a naked attempt by a beleaguered prime minister to distract attention from the real issues. That same prime minister, incidentally, has been at Davos proclaiming the global elites that he is confident that he can keep Britain in the EU. In what Reuters called, "some of his most pro-European remarks to date" Mr Cameron said that he was, "… confident that we'll have a successful renegotiation and a successful referendum", adding: "I'm confident this is do-able, deliverable and, as I say, winnable for Britain to stay in a reformed European Union". There is the context for the bid for a 2017 referendum and, as Lord Kerr points out, there simply isn't time to go through the EU's reform procedure and come out with a referendum in 2017. Yet here we have a prime minister spout his nonsense from the podium of the World Economic forum and he is taken seriously. If that itself isn't an attempt to rig the debate, I don't know what is, but the willingness of the legacy media to go along with it tells you a great deal about the state of the media industry and the people who work in it. The myth is perpetuated by William Hague today interviewed by an uncritical Andrew Marr (from 51.02), telling the gullible television presenter that, "If David Cameron is Prime Minister after the next election there will be a referendum". He says: "We're all very keen for this legislation to go through. The whole Conservative Party [is] absolutely united on holding a referendum before 2017 ... we will not be put off this by antics in the House of Lords or by the Labour Party". Thus we are told that, "There will be that straight choice we now know at the General Election: referendum with the Conservatives or no referendum without the Conservatives". In fact, the reality is that there will be no "in-out" referendum before [the end of] 2017, and little prospect of one in the next parliament. Undoubtedly, though, the Conservative hierarchy much feel that, as long as they can keep public attention focused on the miasma, they will not address the substantive issues and can use the promise to further their electoral interests. Unfortunately for them, and the likes of Mr Martin we have the internet, where those issues can be discussed, breaking the politico-media monopoly. And never more, as the attempts to rig the debate continue, has this been needed.